The fast developing field of nanomedicine uses a broad variety of materials to serve as delivery systems for drugs, genes, and diagnostic agents. 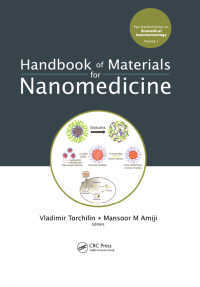 This book is the first attempt to put under one cover all major available information about these materials, both still on experimental levels and already applied in patients. Organic Nanostructures: Polymeric Nanostructures: Synthetic Polymer-Drug Conjugates for Human Therapy, K Ulbrich & V Zubr Dendrimer-Based Nanomaterials, K Nam et al. Combinatorial Polymer and Lipidoid Libraries for Nanomedicine, J J Green et al. Lipid-Based and Other Organic Structures: Liposomal Nanomedicines, V Torchilin Nanomedicines from Polymeric Amphiphiles, I F Uchegbu et al. Materials for Nanoemulsions and Their Influence on the Biofate, E Rozentur et al. Inorganic Nanostructures: Metal Structures: Biomedical Applications of Multifunctional Silica-Based Gold Nanoshells, L R Bickford et al. Metal Oxide Nanoarchitectures for Biotemplating Application, K C Popat & T A Desai Miscellaneous Istructures: Fluorescent Quantum Dots for Biomedical Applications, K Kenniff et al. Lipid Coated Microbubbles and Nanodroplets as Tools for Biomedical Nanotechnology, E Unger & T O Matsunaga Biomimetics: Bio-Inspired Engineering of Human Tissue Scaffolding for Regenerative Medicine, D W Green & B Ben-Nissan and other papers.